Cooperative Institute locator map; click on location to learn more. Click on location to learn more about Cooperative Institute. NOAA Cooperative Institutes are academic and non-profit research institutions that demonstrate the highest level of performance and conduct research that supports NOAA's Mission Goals and Strategic Plan. 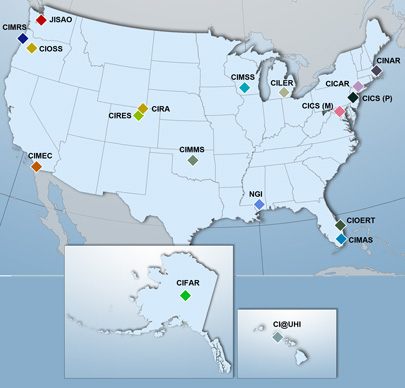 Many of the Cooperative Institutes are collocated with NOAA research laboratories, creating a strong, long-term collaboration between scientists in the laboratories and in the university. Cooperative Institutes not collocated with a NOAA laboratory often serve diverse research communities and research programs throughout NOAA. In addition, many of the cooperative agreements between NOAA and our academic partners provide for formal NOAA sponsorship of students through fellowships. Thus, Cooperative Institutes serve an additional important function: they help educate and train the next generation of NOAA's and the nation's scientific workforce. Cooperative Institutes are located at parent institutions whose geographic expanse extends from Hawaii to Maine and from Alaska to Florida. Currently, NOAA supports 16 Cooperative Institutes consisting of 42 universities and research institutions across 23 states and the District of Columbia.